Whether Martian life has ever existed is still unknown. No compelling evidence for it has been found. When Curiosity landed in Mars' Gale Crater in 2012, the mission's main goal was to determine whether the area ever offered a habitable environment, which has since been confirmed. 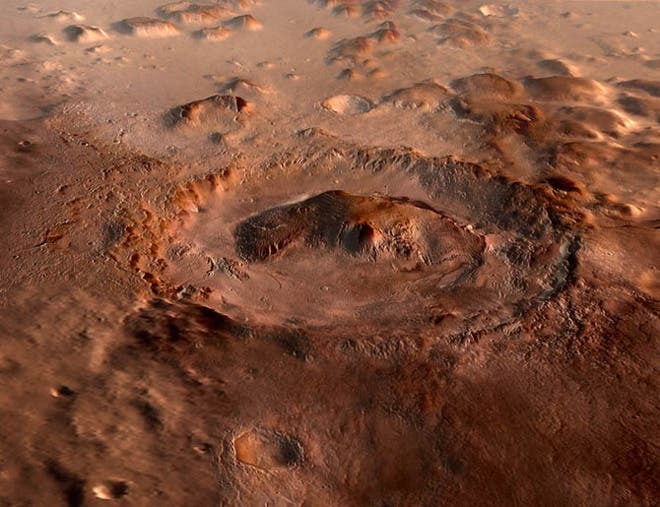 "We detected borates in a crater on Mars that's 3.8 billion years old, younger than the likely formation of life on Earth," said Patrick Gasda, a postdoctoral researcher at Los Alamos National Laboratory. "Essentially, this tells us that the conditions from which life could have potentially grown may have existed on ancient Mars, independent from Earth." "Because borates may play an important role in making RNA–one of the building blocks of life–finding boron on Mars further opens the possibility that life could have once arisen on the planet," said Gasda, lead author. "Borates are one possible bridge from simple organic molecules to RNA. Without RNA, you have no life. The presence of boron tells us that, if organics were present on Mars, these chemical reactions could have occurred." The discovery of boron at Mars' Gale Crater gives scientists more clues about whether life could have ever existed on the planet, according to the paper, published today in the journal Geophysical Research Letters. Rising 18,000 feet in the center of Gale is Aeolis Mons, an outflow channel, 'flows' down from the Gale crater hills to the Aeolis Palus below that seems to have been carved by flowing water. RNA (ribonucleic acid) is a nucleic acid present in all modern life, but scientists have long hypothesized an "RNA World," where the first proto-life was made of individual RNA strands that both contained genetic information and could copy itself. A key ingredient of RNA is a sugar called ribose. But sugars are notoriously unstable; they decompose quickly in water. The ribose would need another element there to stabilize it. That's where boron comes in. When boron is dissolved in water–becoming borate–it will react with the ribose and stabilize it for long enough to make RNA. The boron found on Mars was discovered in calcium sulfate mineral veins, meaning the boron was present in Mars groundwater, and provides another indication that some of the groundwater in Gale Cater was habitable, ranging between 0-60 degrees Celsius (32-140 degrees Fahrenheit) and with neutral-to-alkaline pH. The boron was identified by the rover's laser-shooting ChemCam (Chemistry and Camera) instrument, which was developed at Los Alamos National Laboratory in conjunction with the French space agency. Los Alamos' work on discovery-driven instruments like ChemCam stems from the Laboratory's experience building and operating more than 500 spacecraft instruments for national defense. The discovery of boron is only one of several recent findings related to the composition of Martian rocks. Curiosity is climbing a layered Martian mountain and finding chemical evidence of how ancient lakes and wet underground environments changed, billions of years ago, in ways that affected their potential favorability for microbial life. As the rover has progressed uphill, compositions trend toward more clay and more boron. These and other chemical variations can tell us about conditions under which sediments were initially deposited and about how later groundwater moving through the accumulated layers altered and transported dissolved elements, including boron. The Mars 2020 rover will be equipped with an instrument called "SuperCam," developed by Los Alamos and an instrument called SHERLOC, which was developed by the Jet Propulsion Laboratory with significant participation by Los Alamos. Both of these will search for signs of past life on the planet.